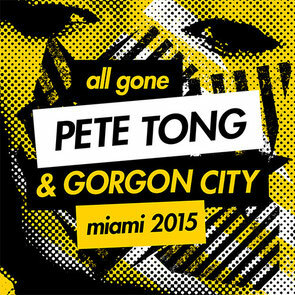 ‘All Gone Pete Tong & Gorgon City Miami 2015’ is a new two CD mix packed full of upfront house, techno and electronica from some of the world’s greatest producers. The compilation featuring tracks and remixes from the likes of Royskopp & Robin, Daniel Avery, MK, Dusky and Maceo Plex – as well as two brand new and exclusive Gorgon City productions. Tong is one of the leading tastemakers of the electronic generation and on ‘All Gone Pete Tong & Gorgon City Miami 2015’ has teamed up with one of the most explosive new outfits. Gorgon City are part of a new wave of UK house producers who regularly blur the lines between the underground and the mainstream. Arguably best known for their UK No.4 hit ‘Ready For Your Love’, to date Gorgon City singles have sold in excess of half a million copies. In additional to inclusions from Booka Shade, Guy Gerber & P Diddy, Scuba, Jonas Rathsman and many more, the release includes three exclusives. Gorgon City have produced two brand new tracks for their mix – ‘The Terminal’ and ‘Sky High’ – while Pete Tong teams up with James Doman on ‘I Lost My Mind’. It’s out 22 March on Defected Records. The All Gone Pete Tong Miami Pool Party - now in its 8th year - is back at the Miami WMC on Thursday 26 March at the Surfcomber Hotel.